Danny M O'Dell gives tips on this often-neglected area of strength training. What happened? How can he be so strong yet not be able to finish the lift? Well, it may have to do with his grip strength or lack thereof. Obviously, if he can pull, but not hold onto the bar then there is an identified problem that needs correcting. Many sports require above average hand strength. 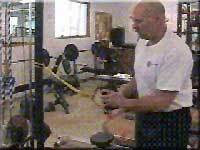 How well your athlete is able to control the torque of the tennis racket as a ball hits the strings, throw the hammer, and handle the oars in rowing or the hold onto the shaft of the pole vault all depend on your athlete's ability to provide adequate power in maintaining their grip in a superior manner. The following article illustrates a slick device for increasing your hand strength; it is then followed by a list of different grip exercises. It will be left up to you as a coach to incorporate these movements into your athlete's developmental program. 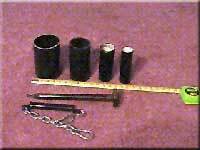 The accompanying photographs (Fig 1-3) show a great device for developing your grip. Each piece of PVC tubing fits into the next larger one. The diameter of the handle can be made larger or smaller depending upon the level of difficulty desired. Naturally, the smaller the handle the easier will be the task of holding onto the resistance. 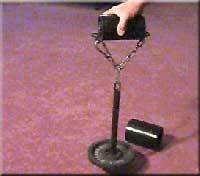 Once the handle becomes over three inches in diameter, the ability to grip and lift becomes problematic. Slowly adapt your strength with each successively larger diameter handle. Not only are these handles useful for simple lifting exercises, but they can also be adapted to the pulley, band or elastic modes of resistance training as depicted in fig 4 and 5. In addition, the larger sized handles make chin up and pull up exercises much more difficult to accomplish. The Thors hammer is an adjustable dumbbell with plates added to one end only. 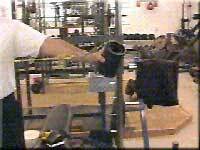 Sledgehammers can be used in place of the dumbbell, but minor adjustments of weight are easier if the dumbbell is used. 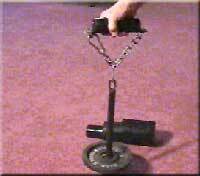 Begin holding the bar near the weight until you build up the strength to use the lever of the full handle. The next movement is with the plates to the rear, again the motion down and up using only wrist action. Begin the development of your grip strength by working on your endurance first then go to a strength-based program that employs heavyweights coupled with low reps.
Danny O`Dell is an NSCA Certified Strength and Conditioning coach from the USA. He is the author of a number of training manuals including The Ultimate Bench Press Manual, Wilderness Basics, Strength training Secrets, Composite training and Power up your Driving Muscles. Danny has published articles in national and international magazines describing the benefits of living the healthy fitness lifestyle.